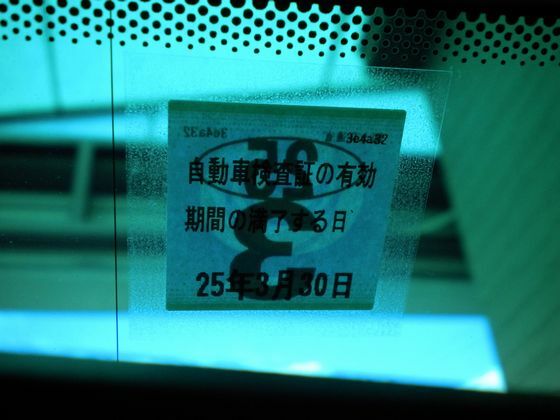 Shaken (車検) is the name given to the checks and taxes levied on a vehicle in Japan. If you are a car owner, you better get familiar with it! Presuming you're driving a standard car (yellow-plate or white-plate with no spade arms or water cannons), yours will be every 2 years. You can check when it is due by consulting the square sticker (usually) in the middle of your windscreen. It will be in Japanese years, so if you aren't sure, use a calculator. Essentially a 60-point test on your car, some running checks, and various charges - normally just the 2-year compulsory insurance, and weight tax (see below). You can book online with agents such as Autobacs (all in Japanese). Or ask in person: "Shaken kudasai!" will do the trick if you don't have a Japanese friend. It's best to have a decent enough grasp of the language to get through the basics though (make and model, make a reservation, understand the procedure for replacement parts etc). You may well be given a courtesy car for the 2-3 days it typically takes. It's worth noting that there are two types of businesses that offer shaken services. The first is usually a gas station or small garage which doesn't have the inspection equipment/qualification. 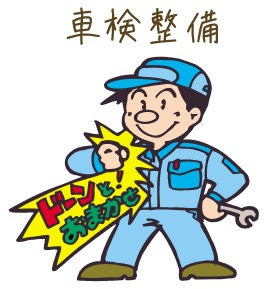 The second owns its own equipment (know as a 民間車検場, or minkan shaken jou) - often a brand dealer or large garage. The latter is cheaper. A typical commercial charge for shaken inspection on a white-plate car might be somewhere around 70,000 yen. If any work needs doing to the car, of course, expect that number to rise. A yellow-plate car will be cheaper because the weight tax (see below) is significantly less. These cars have a weight tax of just 7,600 yen compared to the average of 20-30,000 for a white-plate. A cheaper shop option is Clear 25, which is a(n up-and-coming) bare-bones fast-track inspection centre promising not to do any work on your car unless absolutely necessary. Prices start from around 54,000 yen for a yellow-plate and between 70-90,000 for the average white-plate. Another cheap choice is Holiday. Check here for a quote on your class of car and to find the nearest shop. It's possible to do the 60-point check yourself (or pay someone to do so), and then drive to a user-shaken centre and run your car through a ten minute test shed, fill out some paperwork and pay the fees. The tests require no skills, though will take a little time. You may also need to drive a little way to find your designated centre. If that appeals to you, read our guide. ※ The above rates are accurate as of March 2012. Chart adapted from the Autobacs website.